Why Lhasso Adventure? - Lhasso Adventure Pvt. Ltd. The pre-packaged trips are not a must to purchase, if there are things you would like to add in or leave out in the itinerary, you can tailor it upon your interest. Lhasso Adventure trips are very flexible and easily customizable. If you are interested in our fixed departures, you can join it or you can make your solo trip. Moreover, we also provide travel information to the individual travelers. We believe in providing great values for your money, while travelling with Lhasso Adventure. Not every expensive trip is wonderful. Trips that we offer are remarkable and so are our prices competitively reasonable. We have trust in that our service always make great satisfy to the customers. Client’s safety is a major priority in the adventurous. They are always primarily taken care and given personal attention in the trip. 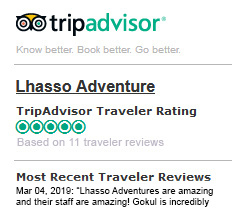 Lhasso Adventure provides excellent service to the customers and it has well-knowledge and qualified trekking leaders. So, they deliver right information to right time about the travel places. Also, we do quick response and take care to the clients. Additionally, we do have discount to the clients who have been frequently travelling with us and also to those who arerecommended by them. Due to highly remarkable efforts, Lhasso Adventure has been receiving 60% of the repeatable clients. Lhasso Adventure has been supporting one of our partners Mother and Children Art Foundation (MCAF) since our initial days. MCAF is a non-profit organization working for the improvement of education, health and employment of impoverished women and children in Nepal. We have been contributing10% of profit to MCAF as an aid. Lhasso Adventure believes that, the fund will support to the Nepalese communities.